Date read: 4/5/17. Recommendation: 10/10. 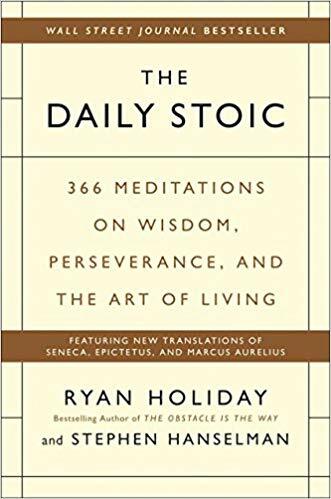 A cornerstone of Stoic philosophy, along with Letters from a Stoic by Seneca. It's critical which interpretation you read. I highly recommend the Modern Library version with an introduction by Gregory Hays. It's a short read with some of the most useful insights and aphorisms that money can buy. Ancient philosophy had a more practical dimension. It was not merely a subject to write or argue about, but one that was expected to provide a "design for living" - a set of rules to live one's life by. One pattern of thought that is central to the philosophy of the Meditations (as well as to Epictetus)...the doctrine of the three "disciplines": the disciplines of perception, of action, and of the will. Together, the three disciplines constitute a comprehensive approach to life, and in various combinations and reformulations they underlie a large number of the entries in the Meditations. Ambition means tying your well-being to what other people say or do. Everything that happens is either endurable or not. If it's endurable, then endure it. Stop complaining. -that he's already been tried and convicted - by himself.